I like shirt dresses, I always have. 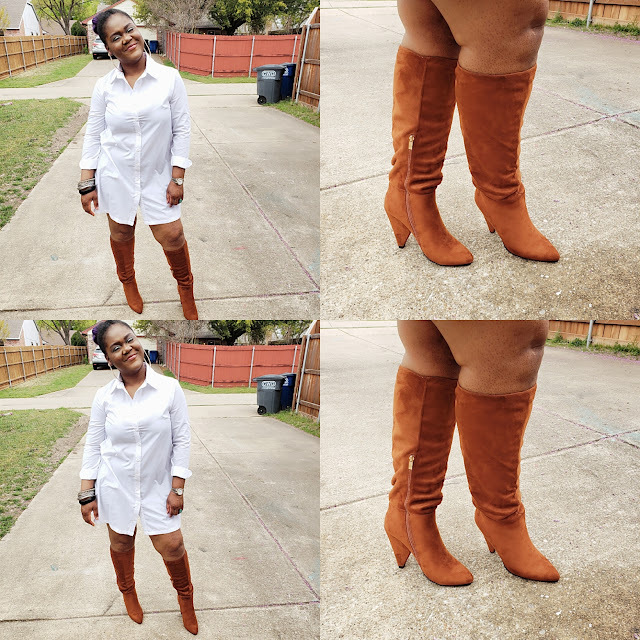 I think they are flattering on every body size and are extremely versatile pieces. Unlike a black shirt dress, a white shirt dress can be a bit more tricky to style and if done improperly, even the most stylish fashionista can come off looking like a private school student. 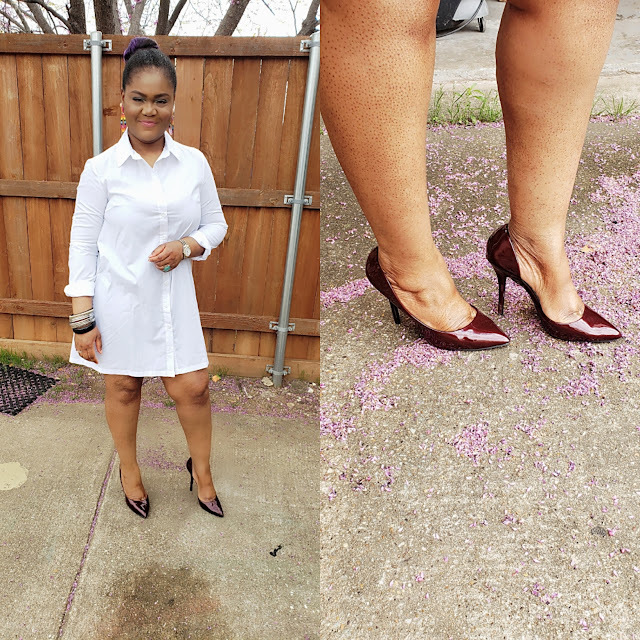 Shoes make all the difference when styling a white shirt dress so below is how to style that one white shirt dress with 8 different pairs of shoes....Enjoy! Pump It Up: Paired with your favorite pair of pumps, that basic white shirt dress instantly makes you look chic and business ready. 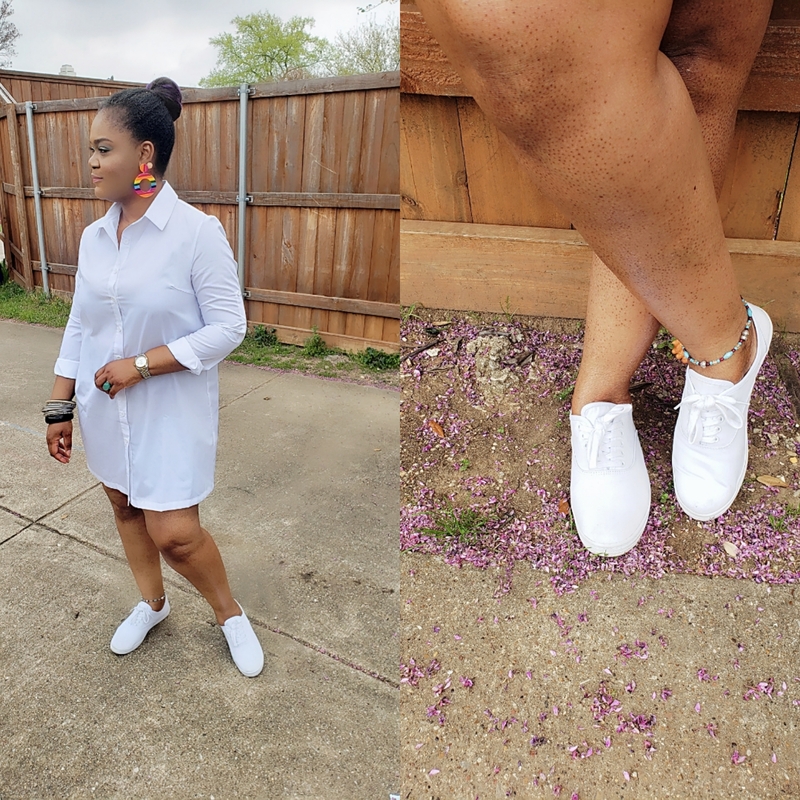 The White Sneaker: By now you can tell that I pair these sneakers with any and everything and that's because they go with any and everything! The look is casual, comfy and stylish. Ready for Combat: Combat boots are perfect to jazz up any plain shirt dress and these grey ones I got as a Christmas gift did exactly what I hoped they would do to the outfit and that was to give it some character and personality. Knee Length Suede Boots: A pair of rich and fun color boots can elevate the basic white shirt dress from drab to fab. 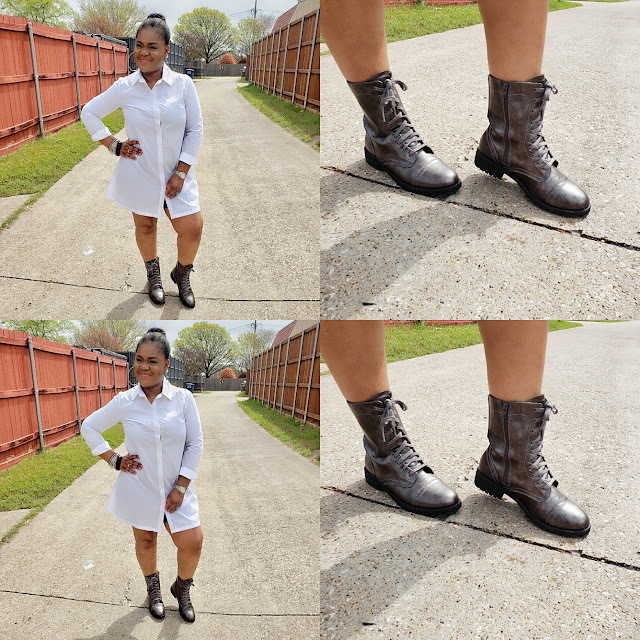 Simple additions like a statement shoe somehow always seem to make all the difference. Flat Shoes: Pair your white shirt dress with flat shoes that have more than one color or a cute design. It breaks up the monotony of the dress and gives your simple look the added sophistication it needs. 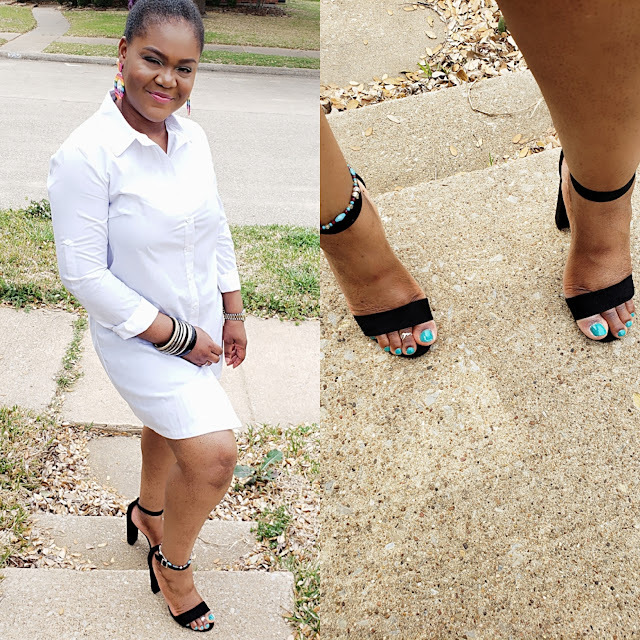 The Wedge: Monochrome your look with a simple black wedge but not just any wedge, one with a significant amount of heel height like this one I'm wearing. 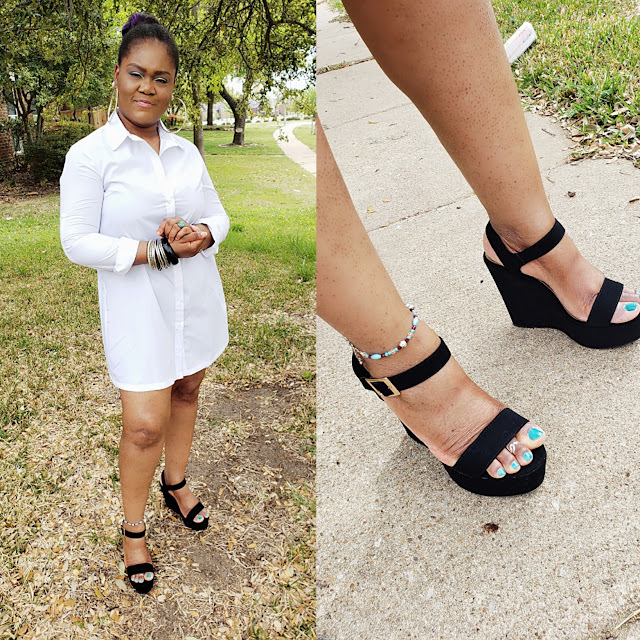 For extra fun, accessorize with an ankle chain and/or toe ring and you are sure to have all eyes on your feet every time. 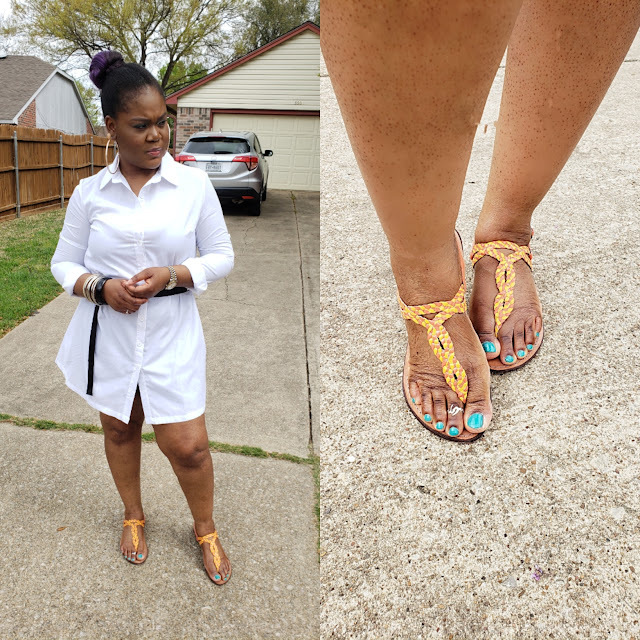 Flat colorful sandals: Your eyes are immediately drawn to the look based on what I have on my feet and that is what your footwear should do anytime you have on an outfit that isn't saying much on its own. The Heeled Sandal: Last but not least is the high or block heel sandal for a chic minimal look. This is a look you can easily pull off to a fashion show and fit right in with the fashion editors and insiders. Other accessories that could amp up the white shirt dress are hats, purses, jewellery, brooches and layers. 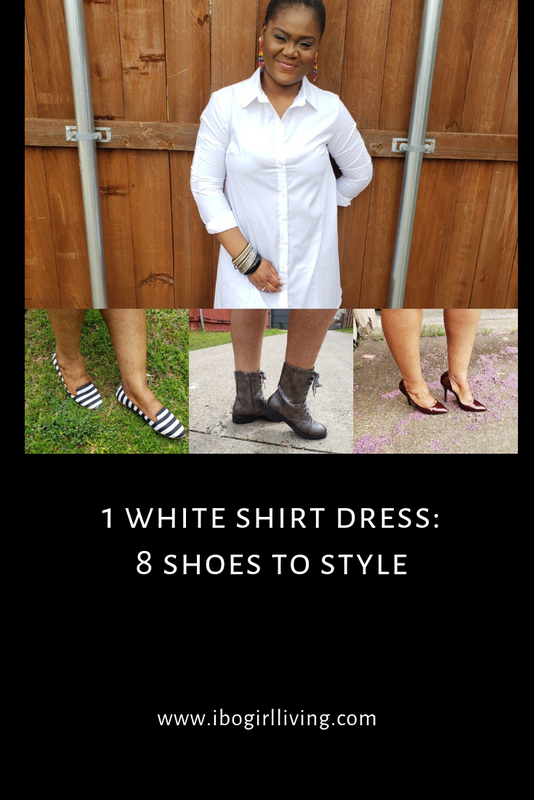 Find what works for you and go from there because the white shirt dress is like a blank canvas so be creative with your choices and have fun in the process.